a manager or head worker on farm or farms, who is mainly engaged in supervision and allocation of duties; superintends work of agricultural labourers, e.g. carters, cowman; is often placed in charge of subsidiary farm under the direct supervision of the employer and manages farm in absence of farmer (011) (q.v. ); may buy and sell produce and equipment in market on owner's behalf. (ii) East Riding of Yorkshire ; has charge of a farm, or part of a farm, where employer is resident. supervises or is master of gang of casual field hands hired by farmer; keens record of time worked or amount of work done, e.g. quantity of fruit or vegetables picked, by each worker. Scotland, Northumberland, Cumberland and Yorkshire; see farm bailiff. a farm bailiff or foreman (q.v.) residing on farm where farmer is non-resident. looks after hedges and fences; prevents damage by cattle; impounds estrays; supervises work of hedger and ditcher (024) and sometimes of estate carpenter (474) (q.v.). keeps clear all drainage ditches on heathland with spade and rake; prevents unauthorised persons from shooting or poaching game or rabbits; gives warning of and attempts to stop heath fires; prevents refuse being dumped on the land. (iv) a general utility man. (Welsh term); a farm worker experienced in all branches of farm work and able to plough, sow, reap, milk, tend sheep and cattle, thatch, repair ditches, etc. 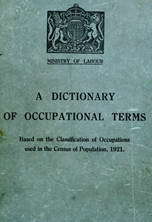 ; usually acts as headman or foreman (q.v.). manages farm where pedigree horses are bred and reared; gives instructions to and supervises work of stud grooms (023) (q.v. ); is responsible for expenditure and for work done on the farm; keeps records of stock; work usually done by head groom. overlooks cattle daily at grass on marshes for farmer who has leased the ground; patrols paths through marsh, makes periodical examination of fences, ditches, drains, etc., and reports any damage or necessary repairs.